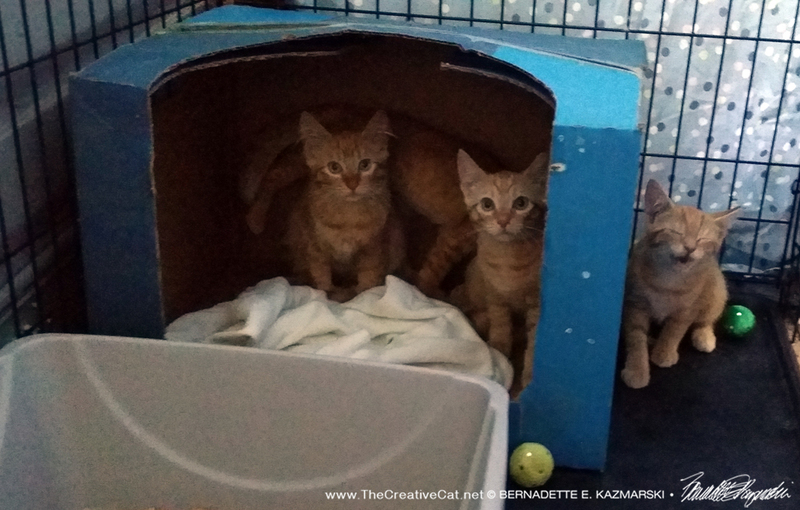 The four gingers settle in, I believe Garfield is looking pitiful and crying outside the box. A little less than two weeks ago I shared information in a post about an upcoming TNR project involving three adult cats and eight kittens. It all went by so fast, we took them all to a farm on Sunday and to my surprise with absolutely no problems at all, from planning to trapping to surgeries to the move. Here is how it happened. I relate these stories in detail both to share the experience and hopefully provide ideas and/or instruction to others who are rescuing cats. Typically I tell one of these stories in several posts, but once we got down to trapping it all happened very fast, so you get the entire story in one long article. 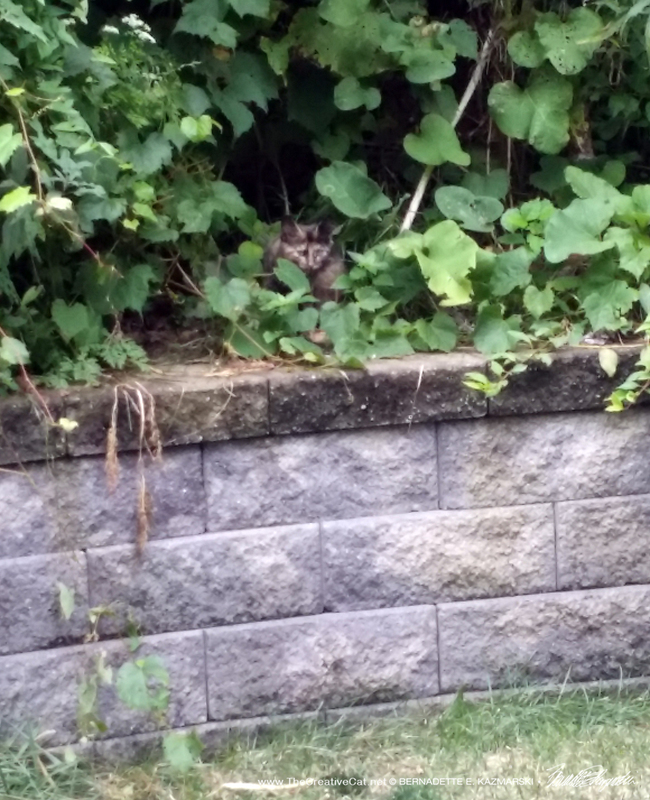 That was in part because the caretakers were more than willing to put their own effort into the process and to my surprise we had none of the usual TNR problems: reluctant cats, angry neighbors, other feeders, escapes, transportation issues. Nothing really held us back. Plus I had the help of Margo who’s always there when I unexpectedly need a foster or a surgery time or a foster for a feral mom. More details at the end of the story. Eleven Cats Off to the Farm! 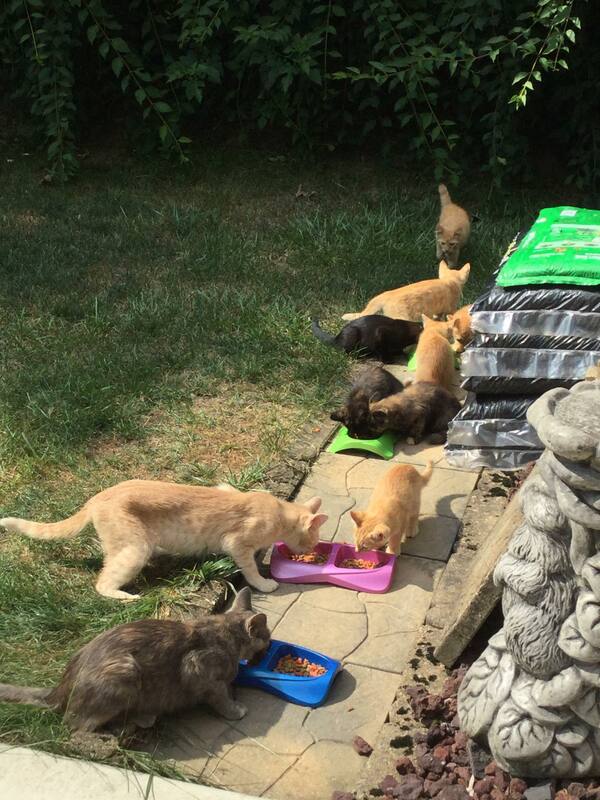 In mid-July I saw a message in a local community group on Facebook from someone who had been feeding three adult cats and eight kittens and desperately needed help with spays and neuters and possibly adoptive homes, anything to keep them from producing more cats. I asked generally where she was, and, since the home was about five minutes from mine I knew I could help. We messaged privately so she could tell me more about them and we could arrange for when I’d stop over. The adults had shown up in January “thin as rails”, so Lorraine had begun feeding them. All was as usual until the adults suddenly brought all the kittens, aged eight to ten weeks, out from the bushes in mid-July. 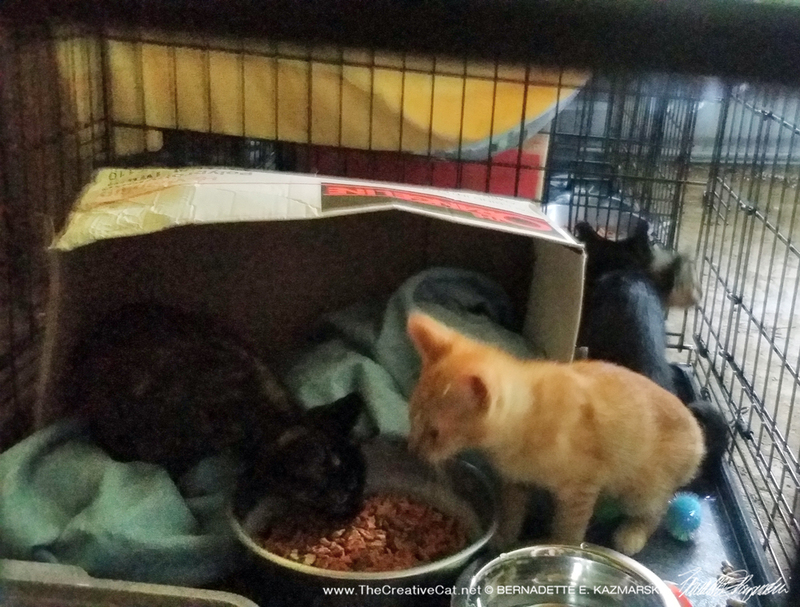 The kittens were very active and curious and were eating food already. As the days passed the entire group spent more and more time in their protected back yard, playing, wrestling, chasing through the grass, walking on the retaining wall, lounging on the concrete patio, and in the process providing hours of free entertainment for the humans and their dog who were all captivated by the kitten antics. The extended family, compliments of the caretakers. I visited around the third weekend of July during a busy cat weekend, and I was also entertained by the antics of five ginger kittens, an irresistible little panther, and two gorgeous torties, light and long-haired and dark and shorthaired, AND three adults. Lorraine, her husband, and son about to go off to college, were completely distracted by the show along with Victoria, who generously donated her back yard to the cause. All the cats had names. They had lots of photos too, as you could imagine. 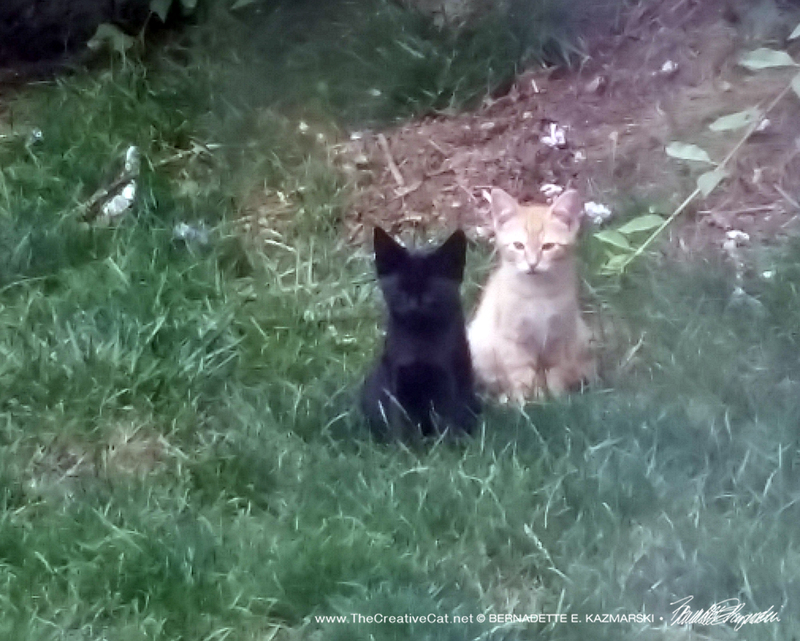 As I watched the cats it looked like two litters; the torties and one ginger were noticeably smaller than the four gingers and little black cat. The adults were decidedly feral, two dilute torties and a pale ginger. Oddly, one of them was apparently ear-tipped, but the kittens had been seen nursing from her. That would be interesting to figure out. We discussed the best plan of action. “I will continue to be their caretaker and feed them regardless,” Lorraine said, just so no more surprise kittens show up. However, 11 cats is a lot of cats to feed, and as they grew they’d be straying from the yard and who knew what the neighbors would think. And if any don’t have to live outdoors the family would rather they didn’t. We talked about socializing the kittens for adoption. They were just on the outside edge of socialization and would take a month or more to bring around, and there were eight of them, a big job. But I could just feel my hands on those warm and lithe little kitten bodies, and teaching those active and curious kittens about living with humans would be an absolute joy. Knowing the popularity of ginger cats they’d probably be gone as soon as they were posted. When I explained socializing kittens like this Lorraine considered taking them on with help from me and possibly others. But their son was leaving for college and they had a vacation planned before he went, she and her husband both work, and then there is Victoria who loves to watch the cats but owns the house and the yard, and the timing was just bad. Chloe, the lovely little “reverse tortie”, more light than dark, and medium-haired. I admit, I wanted her and her sister even just to foster. I agreed. Socializing that many kittens for beginners would be a challenge, even if I took a few, and waiting any longer would send them farther into feral territory. I knew another foster from the Dunbar house would be coming to me so my one and only foster room would be taken up, and I knew Pittsburgh CAT was full to overflowing. I began asking around, but all the experienced fosters I knew, and others who I could teach, already had fosters or just couldn’t do it. 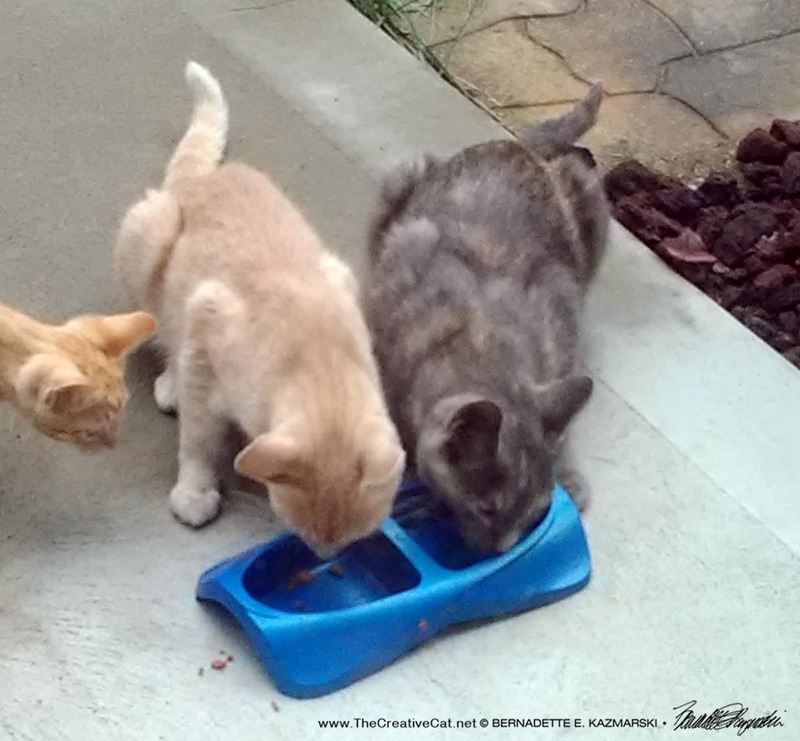 Unless something or someone wonderful came out of the blue, we had to let go of socializing and fostering and move to the original plan, to TNR them and let them live in the back yard. Once they’d had their surgeries they could start working with them outdoors, and if they became friendly, as they probably would, we could work on finding homes that way. I took two traps to their house a few days later so they could tie them open and get the cats accustomed to them, then begin feeding in them. Although they wouldn’t start trapping until I came over to help them at least the first time, I explained to Lorraine and her husband and son how the traps were set and what types of food to use and to toss a cover over the trap when a cat went in. I would secure spays and neuters for the cats and transport them, and had the feeling they were the sort of people who could easily carry it off after one lesson. I would borrow as many traps as I could get to add to my two, knowing that trapping 11 cats and kittens could take several days, and if they became spooked we might have to take a break. They would hold in Lorraine’s garage and be released into the back yard when appropriate, but they might hold the kittens for a day or two extra to see if any seemed amenable to being socialized at that point. They got used to those traps really quickly. Within hours the kittens were playing in and around the traps. I hoped trapping was that easy. I had my open house that weekend so we wouldn’t start trapping until the following week at the earliest, around the beginning of August. The kittens and one adult. 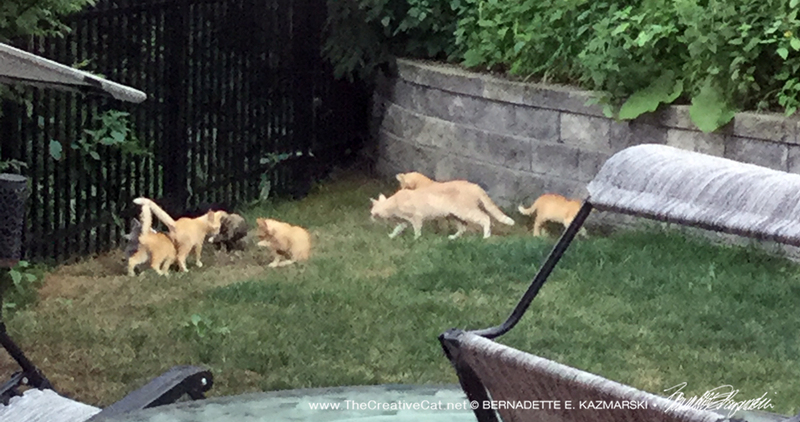 I shared the photos and a video in our feral cat group on Facebook of the cats and kittens running in and out of the traps, ambushing each other and hopping on top and everyone got a good laugh at watching their antics. Looking at the photo of several kittens around the food bowls one person commented that it would be so easy to get them all at once with a drop trap and another agreed. Funny, I had thought that while I watched them eat, but I don’t have a drop trap and borrowing one could be complicated because there was usually a waiting list. But I asked one of our members and hers was indeed available. I made arrangements to get it. I was planning to wait for the next clinic the following weekend but Margo let me know she could get me nine spots at the shelter’s daily spay/neuter clinic on Friday that week and the remaining cats could go to the shelter’s spay clinic the following Sunday so they could all be done a few days apart, if we could trap them all. Then Lorraine messaged to say that a neighbor’s co-worker had a farm and would be happy to take barn cats, as many of the cats as we wanted to send there, even all 11, and things got serious. Lorraine had offered to take them all out to the farm in the traps and return the traps to me, but I explained that if we did this we wouldn’t just be dropping them off. We would be removing them from their own territory and taking them to a new territory already occupied by other animals. They would not stay there but would try to return to their own territory, or die trying. Cats need to be held in cages for up to a month, optimally, so they get to know the sights and sounds and smells and people and animals of the place so that they grow to feel safe in that spot and the area is familiar to them, and it becomes their new territory, along with other animal residents becoming familiar with them. Lorraine understood and sent that along through her friend to the farm owner, who agreed they would find a spot where we could set up their cages. The 14-year-old daughter, who wanted to be a veterinarian, would be thrilled to take care of them under the adults’ supervision. It was all set. We would be trapping all 11 cats in three days, getting them all spayed and neutered, transporting to the farm about 45 minutes away and setting them up to stay. Neither Lorraine nor I were entirely easy about not seeing the farm before we took the cats there, but trusted the judgement of her neighbor who had TNRd cats and socialized cats before, was co-worker and friend with one of the family members of the farm and been to the farm as well. I arranged to pick up the drop trap on Wednesday, the same evening I would pick up Betsy (now Mariposa), who I had trapped at the abandoned house in Carnegie, from the foster who had been holding her since I’d been trapping there and had the first of the cats’ surgeries done in early June. I would be fostering Betsy for adoption, and that is an entirely separate story. First trapping session: six kittens at once! 6 kittens in 20 minutes — 5 minutes to trap with drop trap, 15 minutes to sort into transfer cages. 2 kittens, 3 adults to go. We had intended to start trapping early in the afternoon on Thursday using the drop trap. Though I don’t like to trap in the daytime that was the one and only day Lorraine and her son had something planned, that evening they had tickets to a Broadway production in Pittsburgh. The cats had always been fed when Lorraine got home from work, about 3:00 or 3:30 and I’d seen them gather at that time and knew this would probably work. With luck we’d trap a few with the drop trap and then perhaps set it again or set other traps. 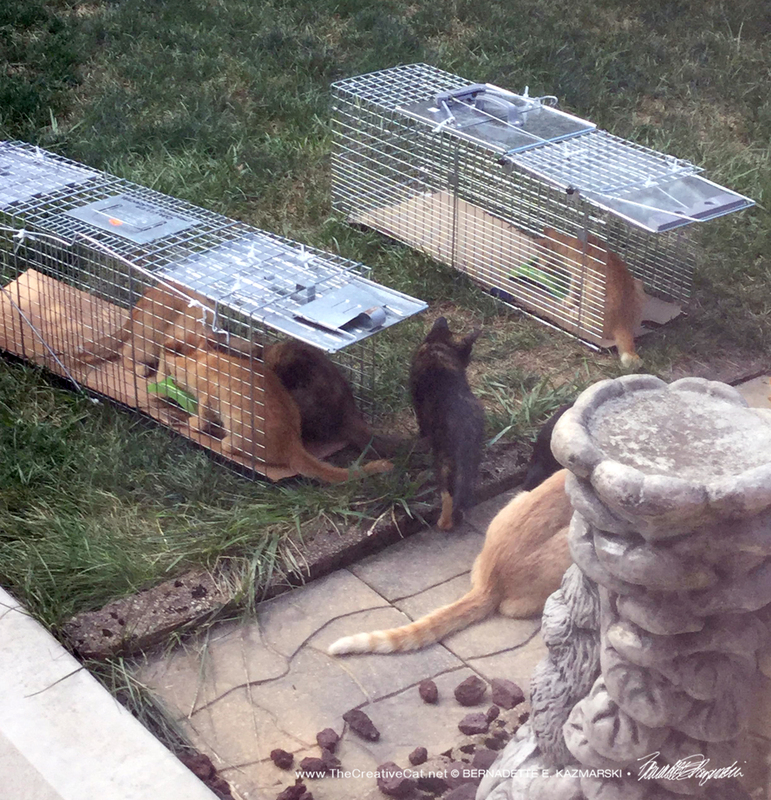 We got started at about 3:30 setting up the drop trap with the transfer cages and other traps and trap covers near, then settling down inside the sliding glass door behind the vertical blind to watch for kittens and cats to show up and gather round the food bowls under the trap. It all happened so fast I had no chance to photograph anything. I was crouching inside the door holding the cord and about to photograph the setup when the kittens began appearing, wary, racing around, but finding the trail of treats leading under the trap, and I didn’t want to move for fear of scaring them off. It was late for their meal and they were hungry, and in a minute or two they lost their fear of the odd thing over their food bowls. All eight of them were there…but one of them was looking at the navy blue dog leash I had attached to the leg that held the trap up on one side, suspicious of what it was and why it was there, following it along the concrete to the door and to us sitting inside behind the blind. Another of the kittens was wavering near him, and both were hovering in and out from under the trap. Six kittens already eating tightly clustered around the bowls under the trap were beginning to break up, aware once again of the cage overhead. The two wary ones would not go far enough underneath, as badly as I wanted to get all eight at once it was way more important to get as many as possible. As soon as the edges of the trap were clear of kittens I pulled the cord. It looked like two wary gingers took off and all the kittens under the trap began bouncing around trying to get out. I have trapped many cats and I know they are fine in the trap until I can run and cover them, but that fear response when they realize they are trapped still upsets me. We ran outside with the quilt and tossed it over the trap and heard the kittens calm underneath and the jumping and mewing subside, then we took a breath and congratulated each other. Whew! From the time the first kitten appeared to that moment was only about five minutes! 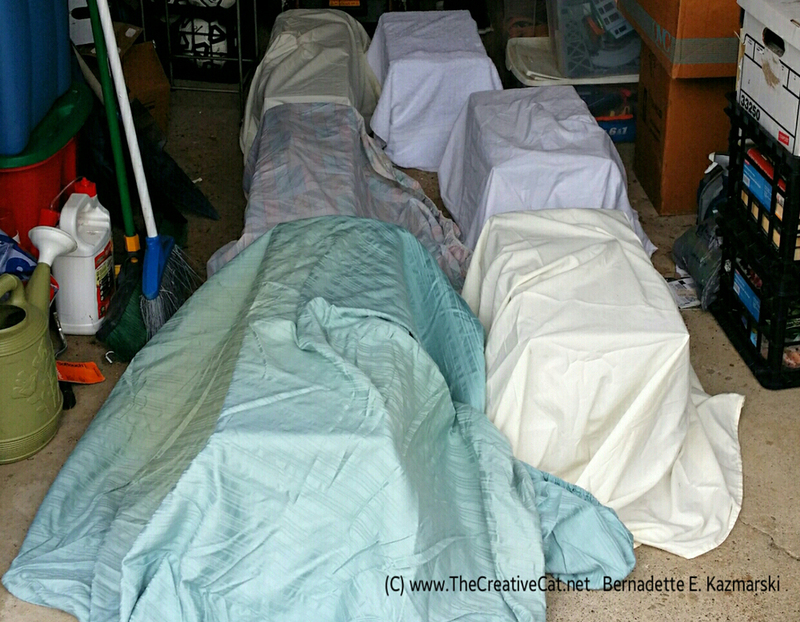 All six kept shifting around under the trap and we spent the next fifteen minutes luring each one of them out from the drop trap into a separate transfer cage or trap to be held in the garage, under a sheet, for surgery the next day. We decided to set the regular traps as well as the drop trap after that since the kittens and adults had become familiar with them. After about 45 minutes the pale buff adult came onto the scene, suspicious, but went under the drop trap and we trapped her too, so we had seven to take for surgery the next day. We packed it all up and closed the other traps. Lorraine would set them early the following morning before work because the cats were always active at daybreak, before dawn. 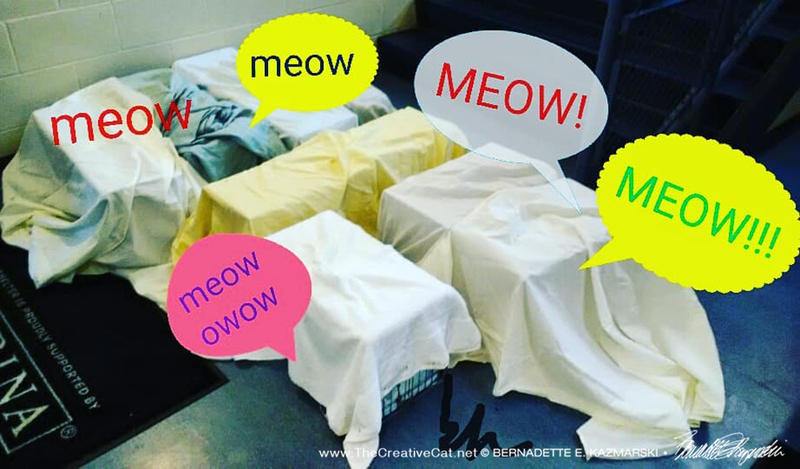 Eight feral cats arrive for spay/neuter singing the song of their people. Their amazing caretaker trapped another before going to work this morning. Only three more to go! When I went to pick them up for a 9:30 drop off at the shelter Lorraine had left for work but her son let me know she had trapped one of the kittens. Eight trapped and only three more to go! Margo had three spots for those cats reserved on Sunday at the shelter. 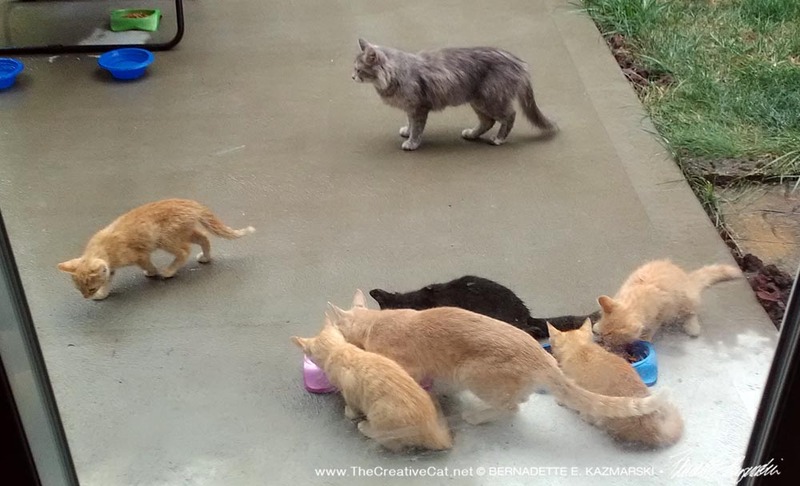 In I went with eight cats in traps…I regularly transport cats to the shelter for surgery so they know me. I’d been in on Tuesday with five, now Friday with eight, but these ones were mine. We all had a good laugh and tried our best to match up paperwork. I picked them at 3:00 and showed Lorraine how to slide food and water into their traps, then we talked about trapping the rest and transporting to the farm. She would set traps that evening and the following morning, then if they hadn’t all been trapped I would come over the next day, Saturday, after a couple of customers came to my house. Those cats would go for surgery on Sunday morning, and when I picked them up we’d meet at Lorraine’s house and leave from there with all of them. If any were not trapped we’d just keep working on it and take them out later. Margo had arranged for me to borrow three large dog crates to hold them all at the farm while they grew accustomed to the sights and sounds and smells out there. We would need to get food and litter, litter pans, bowls and miscellaneous other things to set them up out there. Lorraine caught the one remaining kitten Saturday morning, but the two remaining adults were still at large. One of them appeared to be ear-tipped, but she’d also been seen nursing kittens, so we were going to trap her and check that regardless. I went over in the early evening, just before dusk, my favorite time to trap. We had to double up a few of the kittens to have transfer cages available for those two last females. Lorraine had seen the girls looking into the traps and even reaching in over the trip plate to get the food, so we put those traps away and just set up the drop trap. We waited a while before they showed up and after everything else had gone so well I kept thinking this was the part that was going to be difficult, getting these two experienced female cats. It was dark enough that the light played tricks when watching two dilute tortie females darting back and forth, wary of the drop trap, but finally one came creeping forward from each direction and approached the trap…tiptoed underneath…and began eating—and I pulled the cord. Done! All 11 trapped! We transferred those two into transfer cages and made our plans for the next day, and congratulated each other again. Not only had they all been trapped, but even transferring them to transfer cages, transporting them, feeding them and so on, not one had escaped or scratched or bitten anyone. Lorraine being able to trap in between made it even easier for me and I really appreciated that. After I’d dropped them off at the shelter I drove around to pick up the crates, purchase the litter and litter pans, and visited with Margo and a very special kitten when I picked up one crate from her, more about him later. Then I stopped back home for a quick lunch, picked up the three at the shelter and went to Lorraine’s house. We shuffled bags of food and cats in traps and were ready to go with Lorraine’s neighbor riding with her and me following. The entrance to the farm. The barn is around the bend behind the trees on the right. 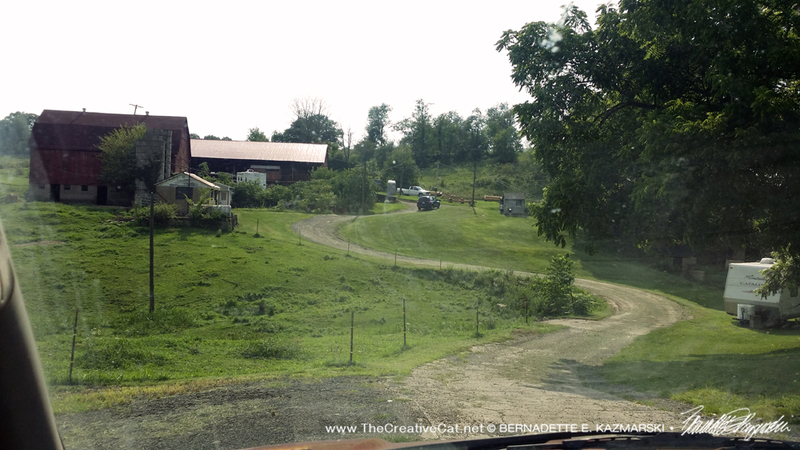 The farm had converted from a dairy farm to a beef farm and also had pigs and chickens. 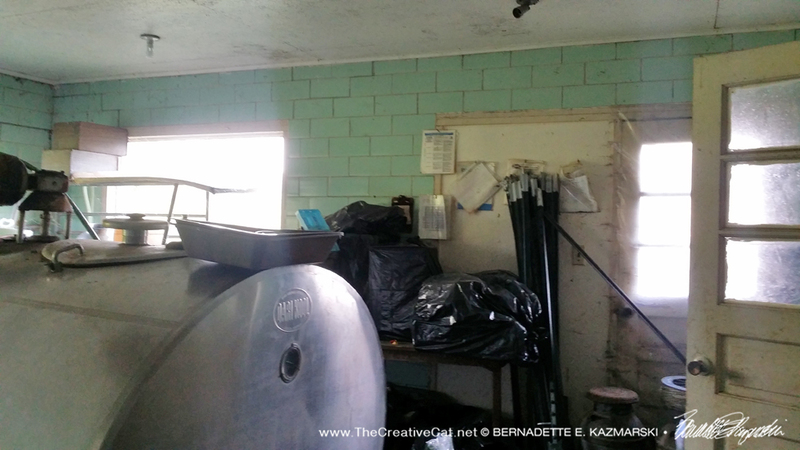 We walked around the former milk house and barn to decide on a space. It had doors that closed and was much cooler than the hay barns. I described our crates, how we’d set up, and what should be done for them each day. 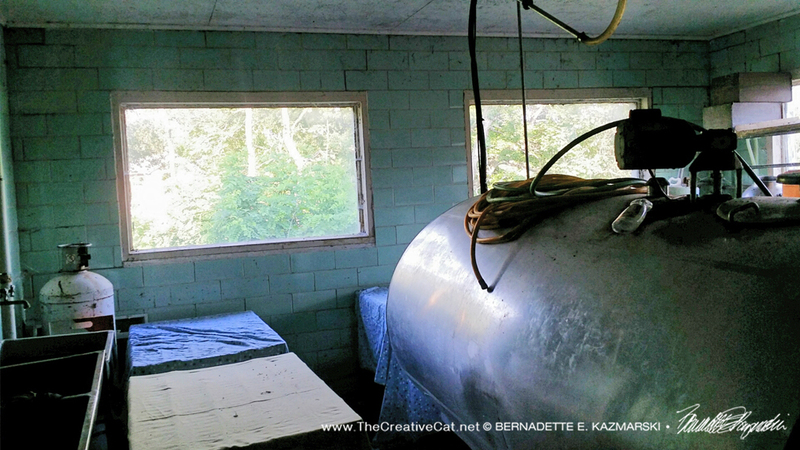 The new barn cats went into the room in the milk house where the big milk tank still stood, though it was no longer used. There was water available there and though the space around the tank was a little tight we set up the three cages and added litterboxes and food and water bowls. Of all things I had forgotten boxes so the cats could have hiding places as well as a little height in their cages, but we found a good box for each cage, then covered them all with sheets that had been donated by a friend. 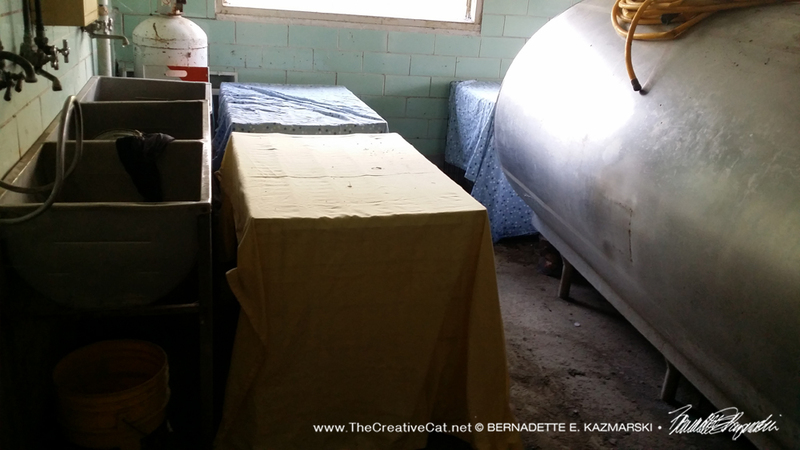 Three crates set up and covered in the milk room. I was glad the door to the room could close for the next part of the adventure: letting the cats out of the traps and into the cages. Typically with this operation there is one cat per cage, but since we only had three cages we had to put three or four cats or kittens into each cage, and each time we added one there was a chance of escape. But none did. We had the three adults, Fluffy, Dean and Chaz, in one cage, four of the gingers in another and Smoke and Chloe the torties, Mischief the panther and one of the gingers in the other (I just couldn’t keep those gingers’ names straight). 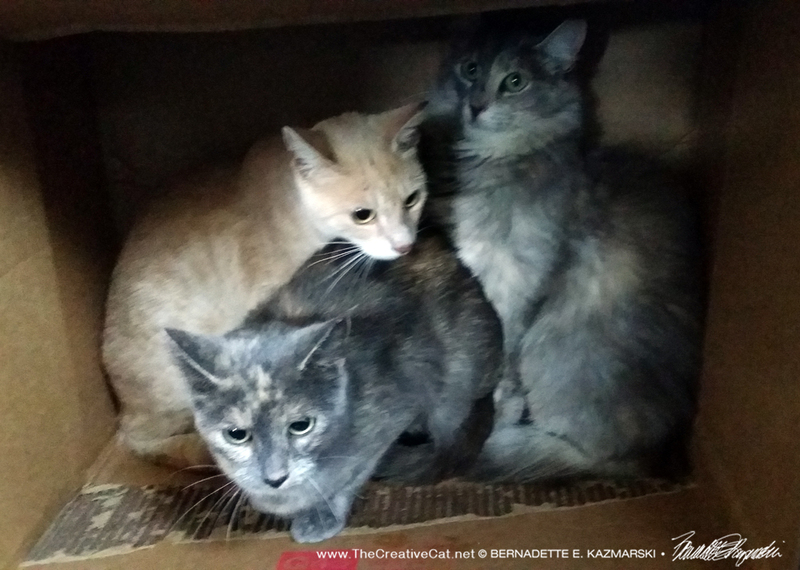 As I opened each trap and encouraged each of the cats out and into the cage, they ran into the box and watched us. One or two kittens kind of crept toward the door along the litterbox, but they were easy to wave back. Dean, Chaz and Fluffy wondering what the h*ll happened. Smoke the tortie and Boo the ginger kitten are already eating. We finished them up, closed the doors, pulled down the sheets and let them start getting accustomed to their new surroundings. Lots of sunlight from the windows. Window on the other wall too, and the door. The building where they are. The room is inside the windows on this corner. We had told the folks at the farm that if any looked like they were unwell in any way, if they seemed they weren’t adjusting, or were very friendly and could be adopted, to let us know and we would do whatever needed to be done, and please, send pictures! Can you imagine this in your back yard? I had meant to tell Lorraine before we started trapping that, since they were going off to the farm, once we trapped them, she would never see them in her yard again, and they’d all be gone at once. Expect to miss them, even if they weren’t really “her cats”. I briefly mentioned it but in the thrill of drop trapping it was lost. We messaged Sunday evening and Monday about what we thought of the setup and how she felt about them just not being out there in the back yard. I know I was missing them, missing the chance to socialize those incredible little kittens, to help find them homes, thinking I could have worked a little harder to find a foster for them, or I could have made space here, but I know my limits with the things I need to do to make my living and to keep peace in my own feline household, and I know I worked as hard as I could, and others helped me look, for fosters. In midsummer everyone is overloaded with kittens, and there isn’t even a possibility to wait for foster spaces to open up. It just won’t happen again until some time in late autumn. So I had to just let that go. Sunday evening Lorraine messaged it felt strange not having them there. I told her it’s a loss, even though they weren’t really hers, animals touch us deeply. She said she thought it was just her being silly. Not at all. I told her how I was feeling too. Even with all the excitement of successfully trapping 11 cats, spaying, neutering, vaccinating, then moving them off to a farm, with no mishaps, all in four days, even though they were feral and would take a lot of work to be socialized, in all that time we hardly touched them, there’s a lot of sadness in letting them go. Animals enter our hearts the minute they enter our lives. Given all the options I know this was the best we could do for them, and it was a good thing to do. When they went to surgery on Sunday, not only was Fluffy, the long-haired dilute tortie adult who clearly had an eartip, already TNRd, but so was Dean, the short-haired one, and recently, like within a few weeks at most. They were still shaved and fur was just growing back. I was shocked that both of them were TNRd. I hadn’t seen much of Dean, but Fluffy was definitely the matriarch of this group and I had seen her eartip the first time I visited, on July 20. But I have photos from Dean on July 22 where she clearly did not have an eartip. I had asked in the feral cat group if anyone was doing TNR in that area but no one responded. That doesn’t mean there aren’t others out there doing the same thing, and that is actually very comforting. It would have been good to coordinate efforts, but at least it explains how an eartipped cat can be nursing kittens! I often mention Margo—that’s Margo Cicci Wisniewski—in my rescue and TNR stories. If it weren’t for her doing things like finding a foster for a feral mom and nursing kittens at 10:00 p.m. or scaring up three cages out of nowhere in one day or getting surgery spots exactly when I need them I could never do all the things I do. I don’t have the means or the time to pull all the parts together and do it without help, and without that I would even sometimes be endangering the cats I’m trying to rescue. So when Margo asks for surgery transports, if I’m not already occupied, I just go, or any other help I can possibly give. Rescuing cats is never just one person’s job, it takes a lot of hands and hearts, and I can only do it with the help and support of people like Margo. In addition, those of you who donated to my TNR projects from this past spring can know that you covered a lot of expenses for me as well because, being self-employed time is money, and gas money, cans of sardines, covering some surgeries, all adds up for me. Lorraine called around to the shelters, messaged to rescues, including Pittsburgh CAT and Homeless Cat, and also called her township to see if they had any help for her. They had none, suggested calling the shelters, and as a last resort actually suggested calling an exterminator. “It would be best for everyone,” the person said. I’ll just leave that here. We have a long way to go. As far as I know they are doing very well, Tabbies! For such a big project it happened so fast I can hardly believe it. I still think about fostering them…but I knew I’d have little Mariposa.